It’s here , its now and it’s not just for the birds. In the US I made my custard from egg yolks, caster sugar, cream, vanilla and cornflour according to Delia Smith. This involved time, skill and concentrtion. In the UK I get instant gratification from birds. This scribble was published on Friday, February 26th, 2010. You can follow any banter on this scribble with the RSS 2.0 feed. You can share your inspired musings after typing the anti spam word near the bottom of the page. But no Pinging because its too naughty. Just crying out for some apple crumble. Which I do bake, so why do I use instant custard? 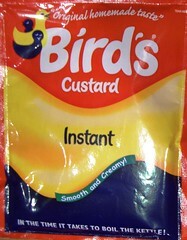 …cos instant custard never has lumps…?